Drawn from His home by the power of Arunachala (The Red Mountain) at the age of sixteen, he remained at Its feet throughout the rest of His life and became known as the Sage of Arunachala. He wrote very little, but is known to have translated and corrected a number of important works for the benefit of devotees. He preferred to communicate through the power of overwhelming Silence, a silence so deep and powerful that it stilled the minds of ardent seekers who were attracted to Him from all over the world. Although preferring silence, He was always willing to answer the questions of sincere aspirants and never failed to guide them in the right direction. His highest teaching of 'Self-enquiry' (atma-vichara) was understood in the infinite silence of his presence. Through this silence, countless numbers of devotees and visitors experienced the pure bliss of True Being. That same experience of perfect peace is still available to sincere souls who turn to him and practice his teachings with devotion. This act of perfect grace can be experienced anywhere, but it is especially palpable at the foot of the holy Arunachala Hill, a hill that has attracted saints and sages for thousands of years. The Maharshi's teaching of 'Self-enquiry' (Pure Advaita) is simplicity itself, requiring no outward formalities, no outer change of life, only a simple change in 'point of view' and a sustained effort on the part of the seeker. The goal is no heaven after death or a faraway ideal, but rather the removal of the ignorance that prevents us from knowing that we are eternally One with our Source, the Supreme Self, or God. It is an experience than can be had NOW! All that is required is a sincere effort, which earns us the necessary grace. On his deathbed the Maharshi told his grieving devotees, "You say I am going away, but where can I go? I am always here. You give too much importance to the body." His promise of a 'continued presence' is daily being experienced by numerous devotees around the world, and it is that experience of 'continued presence' that has inspired many to devote themselves to the path of peace and love. Devotee.—You say one can realise the self by a search of it. What is the character of this search? Maharshi.—You are the mind or think that you are the mind. The mind is nothing but thoughts. Now, behind every particular thought there is a general thought which is the “I”, that is your self. Let us call this “I” the first thought. Stick to this "I"-thought and question it to find out what it is. When this question takes strong hold on you, you cannot think of other thoughts. D.—When I do like this and cling to my self, i.e., the I-thought, other thoughts do come and go, but I say to myself ‘Who am I?’ and there is no answer forthcoming. To be in this condition is the Sadhana or practice of Atma-Nishtha, the exalted state of the Self. Is it so? M.—This is a mistake that people often make. What happens when you make a serious quest for the Self is that the I-thought as a thought disappears, something else from the depths takes hold of you and that is not the ‘I’ which commenced the quest. D.—What is this something else? M.—That is the real Self, the import of "I". It is not the ego. It is the Supreme Being itself. D.—Then what is true devotion (Bhakti)? M.—Whatever I do or consider myself doing is really the Lord’s doing. Nothing really belongs to me. I am here for the service of the Lord. This spirit of service (nishkama karma) really is devotion supreme and the true devotee sees the Supreme Being as the Lord immanent in everything. Worship of Him by name and form leads one beyond all name and form. Devotion complete culminates in knowledge supreme. Even when Bhakti, devotion, is actuated by worldly desires in the beginning, it does not cease when the desires are fulfilled. It increases by an unshakable faith growing perfectly into a supreme state of realization..
D.—Then what is the path of Jnana? M.—Stripped of the ego he establishes himself naturally in supreme Self-awareness. D.—How can we say that both Bhakti and Jnana lead to the same goal? M.—Why not? Both paths lead you to a state of supreme Peace, Mounam, that passeth all understanding. Every living being longs always to be happy, untainted by sorrow; and everyone has the greatest love for himself, which is solely due to the fact that happiness is his real nature. Hence, in order to realize that inherent and untainted happiness, which is indeed the daily experience when the mind is subdued in deep sleep, it is essential to know oneself. For obtaining such knowledge the inquiry 'Who am I?' in quest of the Self is the best means. Bliss is not something to be got. On the other hand you are always Bliss. This desire [for Bliss] is born of the sense of incompleteness. To whom is this sense of incompleteness? Enquire. In deep sleep you were blissful. Now you are not so. What has interposed between that Bliss and this non-bliss? It is the ego. Seek its source and find you are Bliss. Self-Inquiry & Its Practice — by David Frawley. The Vedantic Tradition in Sri Ramana Maharshi— by Swami Siddheswarananda. Sat Darshanα Bhashya — by Kapali Sastriar: translation of Sri Ramana's Ulladu Narpadu with introduction and commentary. http://www.happinessofbeing.com/ A website dedicated to exploring in depth the philosophy and practice of the spiritual teachings of Sri Ramana Maharshi’. Maintained by Michael James. Articles, books for download etc. http://davidgodman.org/ Site maintained by David Godman. 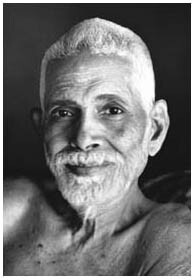 Materilal for download re Ramana Maharshi, translations from the Tamil, etc.